Blue / Light Blue Liquid Soap Pigments/Dye. Our Premium Liquid soap pigment/ dyes come with screw top caps. Please consider using dropper or squirt cap for dispensing. 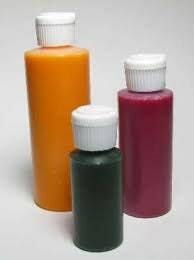 Liquid Dyes can be used for melt and pour soap bases, rebatch soap, cold and hot processed soap and toiletries such body lotion etc.. These are very concentrated and a little goes a long way. We have this available in seven colors. Because you only need a few drops we recommend using a dropper for adding this to your soap. We sell them or you can purchase them in any pharmacy. It is recommended that you use a different dropper for each color. Please feel free to contact us with any questions or comments. Thank you for visiting our shop.